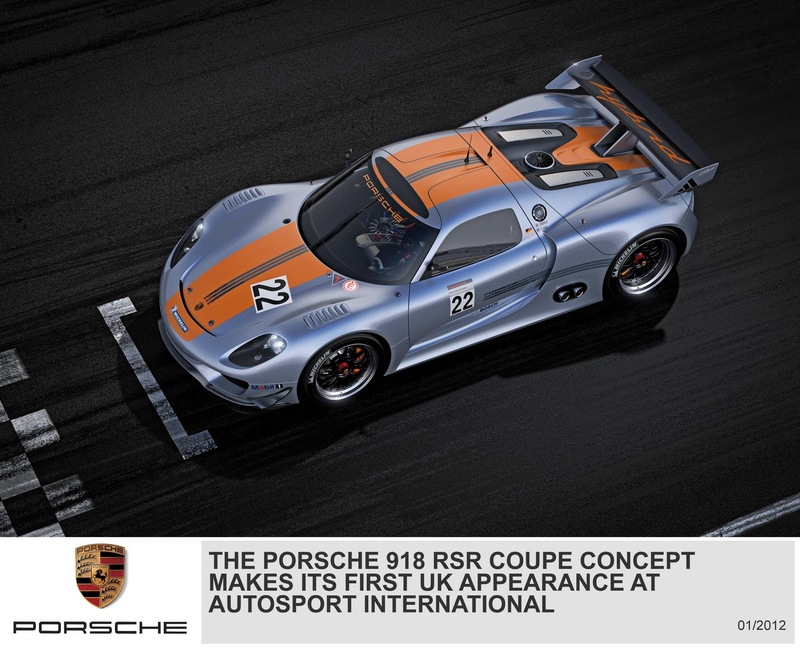 Overdrive: Porsche unveils it's 2012 Motorsport plans and new cars at Autosport International. Porsche unveils it's 2012 Motorsport plans and new cars at Autosport International. Porsche will preview its British motorsport programme for 2012 at Autosport International at the Birmingham NEC (stand 2450, Hall 20, January 12 - 15), show the innovative 918 RSR ‘super sports’ coupe concept for the first time in the UK, and celebrate the launch of the all-new Porsche 911 Carrera. 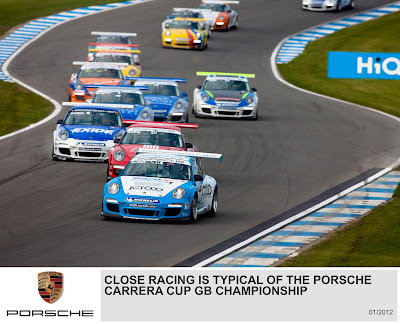 First run in 2003, the Porsche Carrera Cup GB is the fastest single marque racing Championship in Britain. 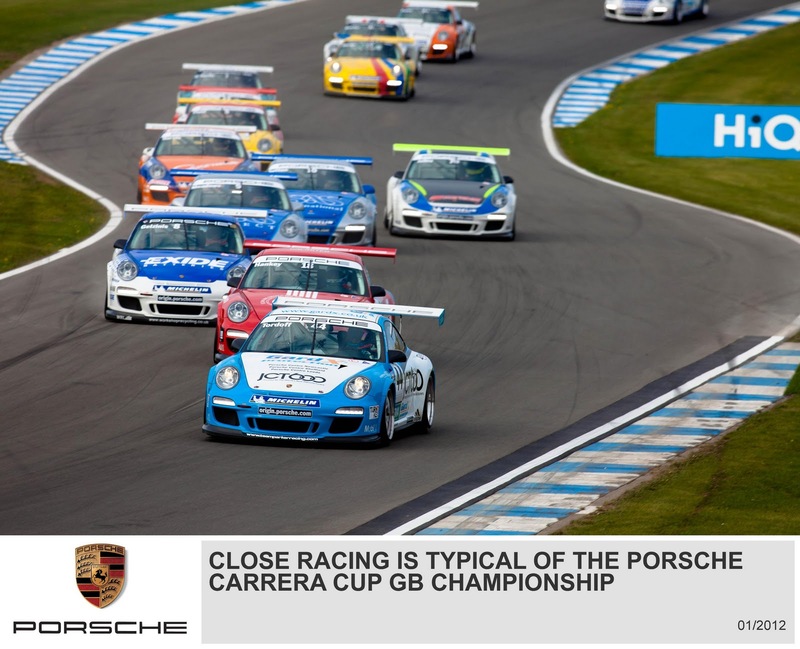 With over 25 identical examples of the 450 hp 911 GT3 Cup race car battling for honours, it provides thrilling support to the British Touring Car Championship at circuits up and down the country. To celebrate the tenth season of the Carrera Cup GB1, a special reward will be presented to competitors who register for the Championship by February 10. Each driver confirmed by that date will be able to offer two of their sponsors a driving day at the Porsche Experience Centre at Silverstone. The driving experiences will be held on Tuesday March 13 to coincide with the pre-season Test and Media Day at Silverstone. 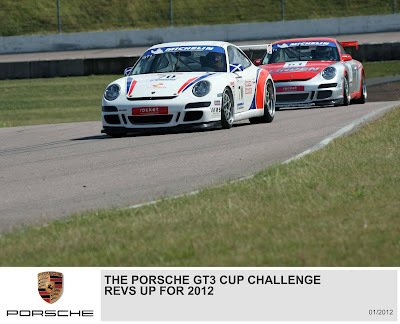 The 2012 Porsche Carrera Cup GB Championship kicks off at Brands Hatch on March 31/April 1. The 911 GT3 Cup car displayed on the Porsche stand is the latest edition of the best-selling racing car of all time, having been built in a production series of more than 2,000 since 1998. The ‘Type 997’ 911 GT3 Cup racer is based on the 911 GT3 RS road car, and is powered by a rear-mounted, 3.8-litre flat-six engine. Nineteen year-old Daniel, from Huddersfield, was selected after two days’ intensive evaluation at the Porsche Experience Centre Silverstone. As the winner of the coveted prize, now in its fourth year, Daniel receives £80,000 from Porsche Cars GB to use as a significant element of his budget for the 2012 Carrera Cup GB season, together with a programme of driver training and personal mentoring. For 2012, the GT3 Cup Challenge has a new six weekend, 12 race calendar. The season will culminate in a finale alongside the Porsche Carrera Cup GB Championship, in support of the British Touring Car Championship, at Silverstone on October 6/7. Open to any 911 GT3 Cup race car from the 2009 model year or earlier, the GT3 Cup Challenge is designed to be a perfect stepping stone for drivers aiming to move up to the Carrera Cup GB in subsequent seasons. It is also ideally suited to younger racers with some sponsorship backing, as well as competitors graduating from track days. The series is open to drivers with a National B race licence. To mark the start of the 2012 GT3 Cup Challenge, and in line with the Carrera Cup GB, competitors who register by February 10 will be able to invite two sponsors to an exclusive day at the Porsche Experience Centre Silverstone. The GT3 Cup Challenge contenders will share the pre-season Test and Media day at Silverstone with the Carrera Cup GB drivers on Tuesday March 13. The 2012 Porsche GT3 Cup Challenge will be launched on the Porsche stand at Autosport International at 09:30 on January 12. Unveiled at the 2011 North American Auto Show in Detroit and on show in the UK for the first time at Autosport International, the 918 RSR is a two-seat, mid-engined test-bed that combines the innovative flywheel and electric motor technology of the 911 GT3 R Hybrid race car and the design of the 918 Spyder concept to create a futuristic ‘super sports’ car concept. The 918 RSR is based on the Porsche 918 Spyder concept that was first seen at the Geneva Show in 2010, and which has subsequently been confirmed for production in 2013. The 918 RSR artfully blends styling cues from iconic Porsche racing cars from the 1960s and 1970s with cutting-edge technology. The elegant flow of the car’s styling is dominated by muscular wheel arches, dynamic air intakes and a distinctive cockpit. A visible fan wheel above the rear engine compartment imparts further styling cues reminiscent of classic Porsche sports racing cars. Motor racing technology also dominates the specification of the RSR under the skin; an especially light, torsionally-stiff carbon fibre-reinforced plastic (CFRP) monocoque. The V8 engine is a further development of the direct injection engine from the RS Spyder race car, tuned to deliver an output of 563 hp at 10,300 rpm. Two electric motors on the front wheels between them contribute 150 kW (204 hp) to the peak drive power of 767 hp. This additional power, which is generated during braking, is stored in an optimised flywheel accumulator, similar to that which has been successfully used in the Porsche Motorsport-developed 911 GT3 R Hybrid in 2010 and 2011. 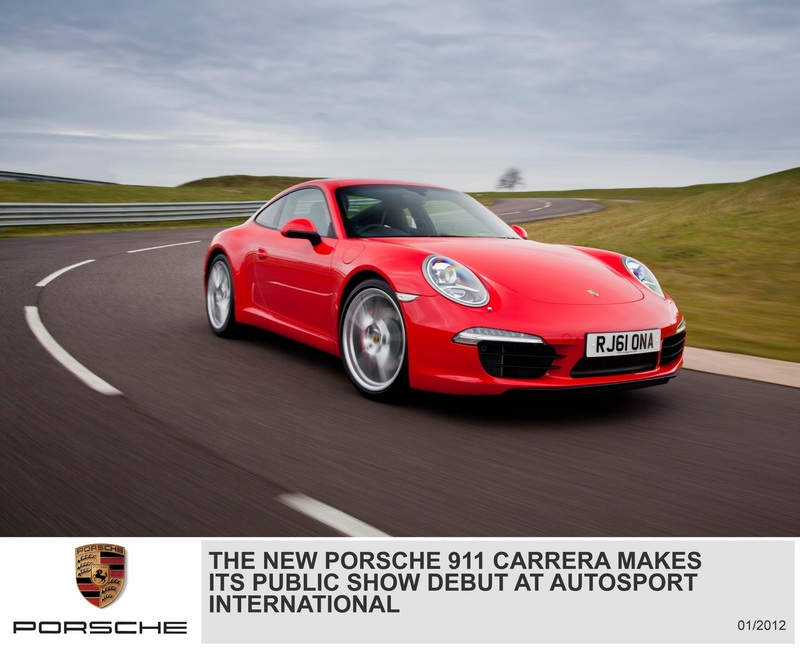 The new 911 arrived in UK Porsche Centres on December 17, and makes its public show debut at Autosport International on January 12. The Porsche 911 has been continually evolving since its launch in 1963, and motorsport has played a key role in the development of the iconic sports coupe. True to the 911 tradition, the new model combines a powerful rear-mounted flat-six engine with the iconic 911 silhouette and adds more power and efficiency, less weight and a host of new technologies to further enhance the sports car driving experience.